An invitation for churches, organizations or individuals who want to share the good news in a fresh new way--- sponsor a Bible Comic Translation. Matthew 4:1-11 Following his baptism, Jesus is tempted by Satan in the wilderness. John 3:1-17 A Pharisee named Nicodemus seeks Jesus at night. John 4:5-42 Jesus encounters a Samaritan Woman at the well. John 9:1-41 Jesus heals a man who has been blind since birth. John 11:1-45 Jesus raises Lazarus from the dead. Each comic translation will consist of 4 comic pages. They will be made available in PDF format which can be downloaded for free from the Earnest Illustrations website http://www.earnestillustrations.com/. How much does it cost to sponsor a comic translation? The cost is $500 per bible passage. A dedication in the comic translation. The dedication can be on behalof of you, your church or organization, or in memory of a loved one. You will also be listed as a sponsor on the web page where the passage is downloaded. This may also include a link to your website, if you have one. 10 printed color copies of the translation. 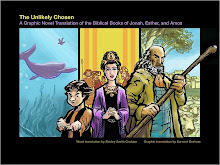 A CD with digital file of the translation, as well as other bible comic translations. The benefit of knowing that the Good News of God’s word is being shared in a fresh new way with people around the world. They are being used by churches in worship, Sunday School classes, Small Group Bible Studies, and by people and families. Please sign up by February 25th to sponsor a passage for Lent. Blessings to you all in this New Year!